Nollywood actor Muna Obiekwe has passed on but his memory continues to live on the minds of his fans and those he worked with in the industry. Some people were thrown off by the fake account denying the actor’s death, but now the confirmation has been verified, tributes continue to flood in. Genevieve Nnaji, Halima Abubakar, John Dumelo, Van Vicker and more are among his colleagues who have shared their grief about the untimely death on social media. 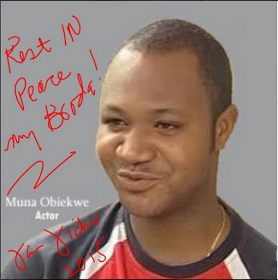 Rita Dominic: RIP Muna Obiekwe… This is so disheartening.. Well God knows best. Adieu dear colleague till we meet to part no more ..